Ann Arbor is known as a college town, and admittedly some of the attractions, such as microbreweries, aren’t really designed with kids in mind. But that doesn’t mean that Ann Arbor isn’t a great place for a family vacation. There’s plenty to do in this city, and many activities that will delight kids as well as the whole family. Best of all, many of these family friendly activities are on the affordable side so you can give your family a fun vacation without breaking the bank. The fairy doors of Ann Arbor first cropped up in 1993, in the home of Jonathan B. Wright. Since then, several public doors have opened throughout the city, and a few have even moved around based on the fairies’ whims. 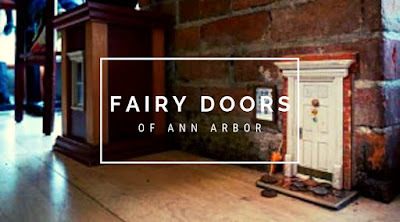 Wright, a self-proclaimed “fairyologist,” has created a map on his website of the fairy doors he’s discovered in his time in Ann Arbor and where you can find them. You can make a scavenger hunt out of it, splitting the family into teams to see who can find the most fairy doors. But watch out, you may even find a goblin door while you’re at it. Ann Arbor is well-known for its beautiful parks — so well-known, in fact, that it’s been called the “City of Trees.” The 69-acre Gallup Park is by far the most popular, especially amongst kids. This park is situated between the Huron River and Geddes Pond, creating small islands that you can explore through use of pedestrian bridges. There are two playgrounds as well as a picnic area and two picnic-shelters in the event of rain. For kids bored with the playground scene, there’s an open field where you can kick a ball around or play whatever you’d like. There are also trails for biking, walking, or running for more athletic families. AirTime Trampoline Park is the kind of place energetic kids only dream about. 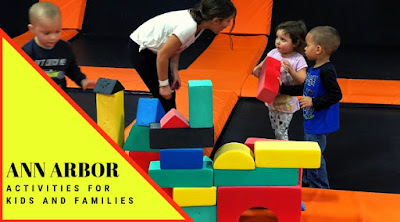 The main stage is a floor and walls covered in trampolines so that your kids can quite literally jump off the walls (and do so in a safe space where they don’t have to test your patience). There’s also a trampoline based basketball court where you can slam dunk, and for particularly competitive kids, there’s the techno warrior course. This is the perfect place to take the kids for a special event, and you can book birthdays and private parties here as well. For an open jump visit for the whole day, it’s just $15 per person, while a family “Weekday Fam Jam” is $50 for 4 people for 2 hours. Ann Arbor is a delightful city for kids and adults alike, and if you’re looking for family friendly activities, you won’t have to look very far — or pay an obscene amount of money to find it. You may even be able to save when you book your accommodations. At University Inn, we offer 10% discounts to parents and students visiting the University of Michigan campus, as well as to parents of UM or EMU athletes. But only if you book direct with us. Contact us today for more information. What Are the Fairy Doors of Ann Arbor? You may have seen them if you’ve ever visited Ann Arbor before. They’re hard to notice at first, but look down and there they are: tiny doors built into buildings or homes, large enough only to fit a mouse or, if you’re well-versed in folklore, a fairy. The doors have a curious history in Ann Arbor, and there have even been parodies and copycats that have followed since they were first installed. But this all adds to the quirky charm that’s so characteristic of this city, and it’s why the fairy doors are so beloved. The first fairy door of Ann Arbor was “discovered” in 1993, in the home of graphic design teacher and University of Michigan alum, Jonathan B. Wright. Several others were found in his home over the years, and some were even said to disappear. Soon, fairy doors began to appear throughout Ann Arbor. Wright created a website, “Urban Fairies” in which he provides a map for tourists of the places where he’s discovered public fairy doors. Tourists will sometimes leave trinkets beside the fairy doors, such as small toys or flowers. Though it’s commonly known that Wright is the artist behind the fairy doors, he prefers to refer to himself as a “fairyologist” who’s discovered fairy doors throughout the city. In doing so, though, he created quite a trend that now other cities have begun to mimic. There’s some debate over whether or not Wright created the concept of fairy doors originally, but here in Ann Arbor, locals will tell you that his were the first. Wright has also written a book about the phenomenon, entitled Who’s Behind the Fairy Doors? There were once ten public fairy doors but, in keeping with the mysterious nature of them, some have disappeared over time. There are still some fairy doors, however, that you can find walking through the city, especially using Wright’s tour map. Double glass doors that match the real doors of the Michigan Theater can be found to the side of the doors, sometimes with the image of a picture frame behind them. The Ark, a local music venue, features its own miniature built into a wood panel of an exterior wall. The Red Shoes, an antique store in the city, has a favorite fairy door with a characteristic red door that can be found both on the interior and exterior of the shop. Peaceable Kingdom was a gift shop in Ann Arbor that closed in April of 2017. However, the fairy door, which shows a fairy sized gift shop inside, still remains. UM’s Mott’s Children’s Hospital has a small fairy door labeled the “Wing Wing” of the hospital, for "Faireez, Insectz, Burdz and Batz." Sweetwater’s Coffee & Tea’s fairy door is inside, so it’s harder to find, but look at the baseboards on opposite wall of the counter. There you’ll see a small fairy-sized version of the cafe entrance. Nicola’s Books, a local bookstore, has a small fairy door above the fireplace made of two book spines: Andersen’s Fairy Tales and Cinderella and Other Italian Fairy Tales. Clearly, the fairies have a reading preference! At least two subsequent fairy doors have also opened in Sweetwater’s. You can also find a small, grey goblin door in downtown Ann Arbor, which displays the tombstone of a fairy beside the entrance. The question is where to stay while exploring this local phenomenon, and the answer is the Unviersity Inn of Ann Arbor. Unlike fairy doors, we’re easy to find, at the intersection of Washtenaw Avenue and Stadium. We also offer 10% discounts to families and students visiting University of Michigan, or parents of athletes for either UM or Eastern Michigan University. Contact us today to book your stay. Not every vacation needs to hit the east or west coast. Ann Arbor can be a delightful destination for visitors looking for charm, culture, sports, and great food. In fact, in 2017, Ann Arbor ranked as #16 on National Geographic’s 25 Happiest Cities. Ann Arbor has attractions to please all sorts, no matter your age or your interests. Your reason for visiting Ann Arbor is totally up to you, but here are a few of our favorite reasons. If you’re a fan of college sports, especially football, Ann Arbor should be one of your top travel destinations. University of Michigan is a founding member of the Big Ten Conference, and the University of Michigan football team, the Wolverines, plays in the “Big House,” the largest football stadium in the United States. In fact, so large is the Big House that it can fit nearly the entire population of Ann Arbor. Ann Arbor is also the base for Eastern Michigan University, home of the Eagles. It’s also worth noting that when parents of UM or EMU athletes stay at University Inn, we offer a 10% discount. It’s hard to describe Zingerman’s but if you’ve been to Michigan before, there’s a chance you’ve heard of it. When it first opened in Ann Arbor in 1982, Zingerman’s was a deli. In the 37 years since, it’s grown into something more...a foodie behemoth with a corner in all different areas of food. There’s Zingerman’s Bakehouse, Zingerman’s Roadhouse, Zingerman’s Creamery, Zingerman’s Coffee Co, Zingerman’s Candy Manufactory, even a catering location and mail order website. It goes even beyond food, with ZingTrain, a training center for building business leadership skills. But it all started in Ann Arbor, and you can find the Delicatessen as well as the new locations here still. Microbreweries have been gaining momentum in popularity over the past few years, and Michigan on the whole is home to about 150 of them. However, some of the darlings of Michigan’s microbrewery scene can be found here in Ann Arbor. Arbor Brewing Company is the most well-known, and it’s wings have even spread as far as India, thanks to a former University of Michigan alum. For a quirkier brewery, there’s Jolly Pumpkin Cafe and Brewery, known not just for its great beer but its delicious truffle fries. Every June in downtown Ann Arbor, tourists and locals can enjoy the Cinetopia Film Festival, showcasing over 50 of the best feature-length dramas, comedies, and documentaries from some of the most widely respected film festivals. These include festivals like Sundance, Cannes, Tribecca, SXSW, and many more. Cinetopia also includes special programs, such as their Detroit Voices Short Film program, the Ann Arbor Jewish Film Festival, or the Arab Film Festival. Need another reason to visit Ann Arbor? When you book a room with University Inn as a parent or student in order to visit the University of Michigan, University Inn will offer you a 10% discount. Contact us today for more information or to book your stay.